"The author shares with the reader over 20 years of accumulated knowledge in dealing with job searches. A most timely book for those adversely affected by the vicious downsizing the labor force has experienced. Read it and improve your odds of regaining entry into the labor force!" "Great brands endure through the ups and downs of business. Roy Cohen’s career program will help you get the job you need in any market and power up your personal brand for long-term success. He’s one of the smartest career coaches around." "Roy Cohen masterfully addresses all elements of a job search from self assessment to job negotiation strategies in his book The Wall Street Professional’s Survival Guide. Cohen presents this information through logical steps and exercises, which enables the job seeker to use this book as a practical working guide. To illustrate the points, Cohen skillfully provides examples from his vast experiences as a professional coach. The valuable information in this book is relevant to the recent college graduate and to the experienced finance industry professional." "Every page in this book contains at least one invaluable nugget of wisdom to make your job search more effective. Use it as your guide for getting the attention you want and the job you deserve." "Frank and insightful, Roy Cohen provides a practical roadmap for any finance professional in transition." "With great jobs on Wall Street difficult to find, Roy Cohen’s career counsel is invaluable. This book brings to life the tools that job seekers need to prevail in a complex and dynamic marketplace." "In a job world turned upside down by the global financial crisis, Roy Cohen has produced a roadmap for those intrepid souls who wish to begin careers anew — whether in finance or elsewhere. It is never easy to start over, particularly if one is middle aged, but the rewards can be great, both financially and more importantly with relationships. Roy Cohen has written a work about life’s lessons and renewal opportunities. It is a very good read." "Whether you’ve just been laid off or are transitioning into the buy-side or sell-side, Roy Cohen’s book will guide you through the process. Cohen helps Wall Street professionals navigate their way through a job search from self assessment and resumes to networking, interviewing, and negotiating. His exercises, sample responses to interview questions, and resume suggestions are great resources to job seekers. With almost 200,000 layoffs on Wall Street over the past two years, this is essential reading." "It’s great to be able to direct our students and alumni to this refreshingly frank book written by a respected industry insider. Roy provides the real deal on the job market, from assessments and referrals to transitions and separations, with interesting real-world examples to drive home his points. 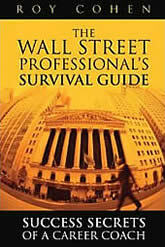 This is just the sort of practical and substantive information needed for those navigating a Wall Street career."